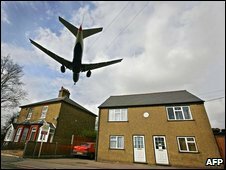 Airport operator BAA has agreed to buy 700 homes under threat from the new third runway at Heathrow Airport. Proposals for the runway have made it difficult for residents in the area to sell their properties. BAA had refused to commit to buying the homes but has now offered to purchase properties within the area in its Property Market Support Bond scheme. The government has agreed to a third runway but the Conservatives and Lib Dems are fighting the plans. BAA said the step was being taken "to reduce the uncertainty faced by residents wishing to sell their property (subject to eligibility)". The airport operator said it would also fund legal and removal costs and stamp duty equivalent to the value of properties at the time they are sold to BAA. The offer is open to residents of 700 properties - including homes in the village of Sipson and part of neighbouring Harmondsworth - for the next 12 months. Labour MP John McDonnell, who has been campaigning on behalf of residents, welcomed BAA's announcement, saying: "BAA has finally realised what a PR disaster this has been in trapping the lives of local residents. "I believe that the third runway will never be built but before we can kill off this runway threat once and for all we need to ensure that families affected by (the) blight are properly protected," he added. Harmondsworth resident Gary Rudland welcomed the decision. He said: "I have taken up the plan because I feel, like some of the neighbours feel, that the area is now blighted. "It's a guaranteed offer, it makes you a cash buyer for your next property and it enables you to escape." But fellow resident Geraldine Nicholson said there was "real fear" that the areas would become "ghost villages" if everybody took up BAA's offer. She said: "The fight against the third runway is not going to stop here. "There are lots of options at the moment and what I would say to people is, 'If you had no intention of going, stay put.'" If all goes according to the government's plan, construction on Heathrow's third runway will start in 2015.